What lighting requirements do Duncans have? What is the best placement for Duncan coral? What type of coral are Duncans? 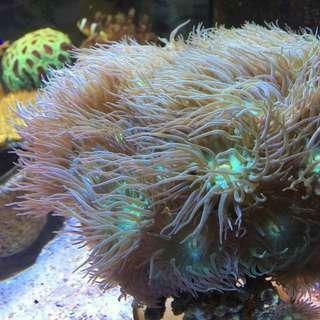 How big do Duncan coral get? How do Duncans reproduce or colonize? Duncans will range in color variations including brownish pink, green, and purple. Most will have a mix of brown and green on the stalk and a light stripe pattern on their poly. The stripe pattern will alternate a brighter and lighter variation of the same coloring. The tentacles will generally be a variation on the color of the polyp base but some will have a purple coloration as well. These corals do well and look almost florescent under an actinic light. The most common names you will see in the LFS are, Duncans and Duncan Corals. Other names that you could run across for this beautiful coral are Duncans Coral, Whisker Corals, Aussie Corals, Aussie Duncans, Daisy Corals. 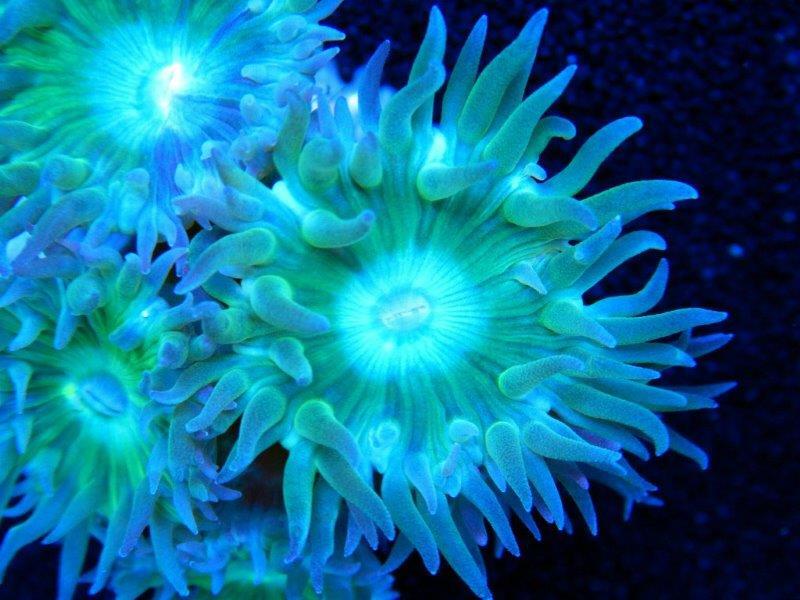 The Duncan coral will feed in large part through photosynthesis using the algae it shares a symbiotic relationship with to feed off of the lights in the tank. They will also feed from the water column trapping small meaty particles in their tentacles. They will then work the food into their mouth at the center of their poly. They can survive for extended periods of time w/out direct feedings and catching left over food from feeding the rest of your tank. They will however thrive from spot feedings of 3-5 times per week. Some reefers even speak highly of covering them with a bowl, cup, or bottle after spot feeding to give them a minute or two to catch the food w/out other tank mates trying to steal it away. 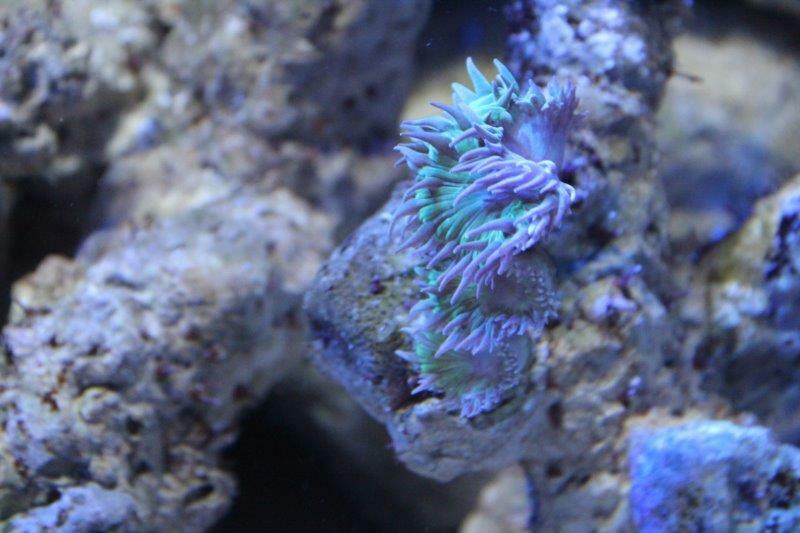 Duncan coral do not require a ton of light but should be placed where they can get low to moderate light. They will do well in a par of 150 – 250 roughly. This puts them in the low to lower Mid on the PAR Chart. 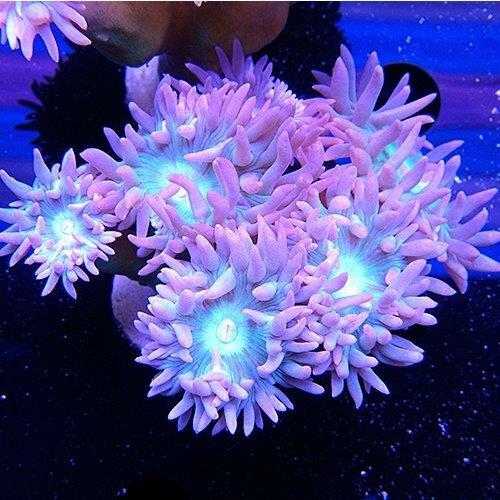 Since these corals grow at deeper depths in the wild it is typically best practice to put them lower in the tank if you have high powered lights. If you are not producing more than 150 par it may be best to move them to a higher location where the light hits strongly maybe even higher in the tank. They enjoy medium water flow. There should be enough flow to keep the tentacles swaying slightly. They should be kept out of strong direct current though to avoid them damaging their tentacles on their own stony base. Where do these corals originate from? Duncan corals originate from the coasts of Australia and the South China Sea. They are found most often in waters 60-100 foot deep on average. They are generally found in lagoon like environments with sand or mud beds. This habitat makes them very resilient to dirty or cloudier water with higher nutrient levels. Duncans are a LPS or Large Polyp Stoney coral. This means they will grow larger polyps over a calcified inner skeleton. If you are stocking multiple LPS coral in your tank you will need to test your calcium and alkalinity levels regularly. The individual polyps can grow and extend to about a 1” center disk with .5-1” tentacles extending from the center disc. The stalk of the polyp will grow to be a few inches tall as well. In the right conditions, there really is no limit to how big a colony can get. This will depend largely on feeding, available space, and water chemistry including calcium availability. As they grow they will consume calcium from the water. This means a large colony or well stocked tank would benefit from dosing calcium and other elements to encourage growth. 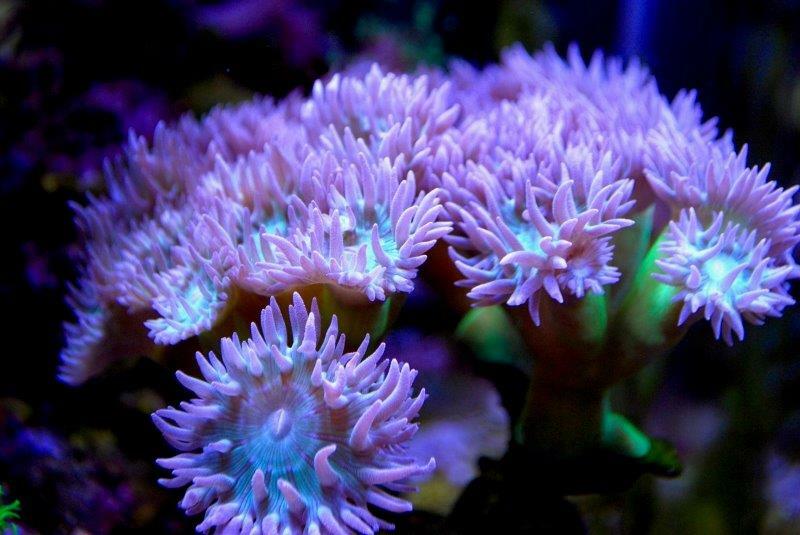 The Duncan will reproduce and grow new polys from the base of mature polyps. This will result in a branching, bush like structure. It is common place to see multiple polyps to start growing off of a single polyp frag. Duncans are easily propagated using bone clippers or even a wet band saw. Separate a single polyp or grouping of polys by cutting it as low as possible on its stalk. This should leave the remaining polyps in good condition and will give a good base to attach the new frag to another rock using glue or putty. I have not run across any cons to this coral in my personal experience. Given ideal conditions they will grow and sprout new heads regularly which can eventually be intrusive on other surrounding corals, that could be taken by some as a con. The fact that it is so easy to frag these though outweighs that in my opinion. This will not grow as quick as green star polyps or xenia. Duncan coral do not have sweeper tentacles like most LPS coral. Their tentacles may poses a slight stinging capability that impacts neighboring coral but if so it is very week and touching them with your hands do not cause any sting to the human body that I have ever experienced from handling them. This coral is one of my favorite. After having my first frag in the tank for only two months I noticed three new heads growing off of the top most polyp. Over just a couple more months these grew to the size of the original 3. This type of success for a new reefer will keep them motivated in their tank and excited to continue in the hobby. 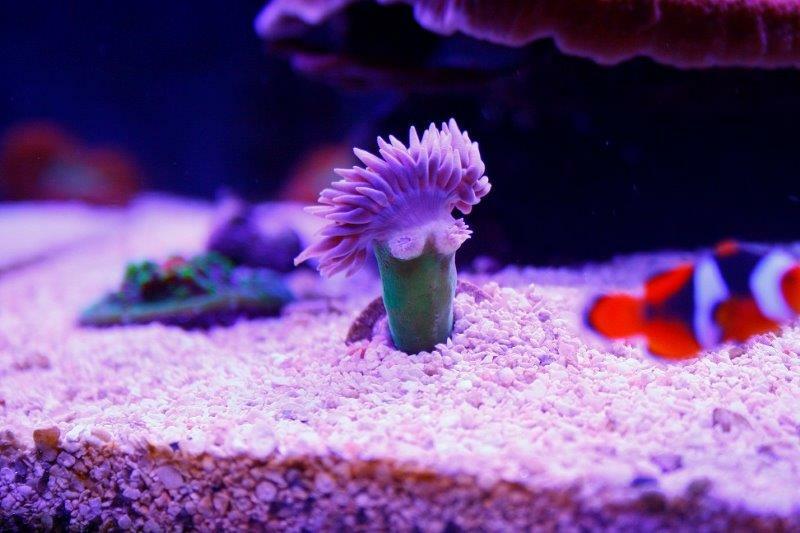 They are a good beginner coral not just in their hardiness, but in the speed they grow and ease of propagation. They are not supper beginner because you should feed and dose them. I include them as a phase 3 beginner coral. Read about my 3 phase beginner coral strategy here. Is there anything else people should know about Duncans? Let us know in the comments below.